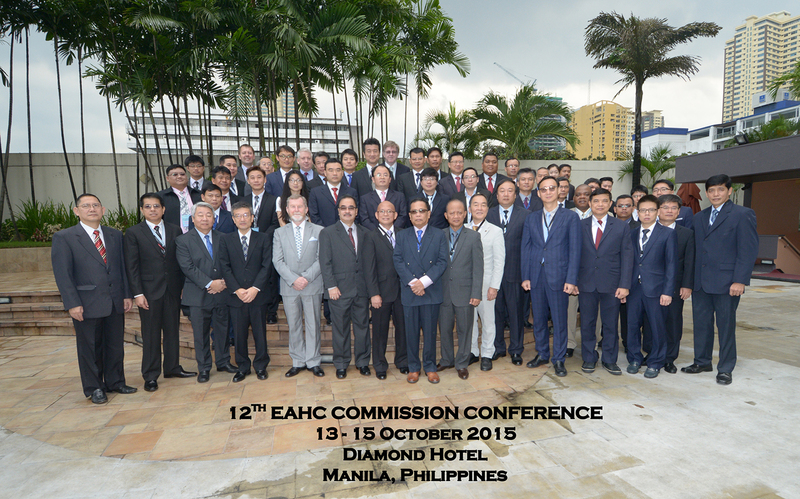 The Philippines through NAMRIA hosted the 12th East Asia Hydrographic Commission (EAHC) conference and the 4th Training Research and Development Center Board of Directors (TRDC BOD) meeting held at the Diamond Hotel in Roxas Boulevard, Manila on 12 to 15 October 2015. The EAHC conference and the TRDC BOD meeting were conducted respectively for the collective goal of the EAHC Member States (MSs), which is to advance navigational safety and protect the marine environment in the East Asia Region. Administrator Tiangco welcomes to the conference the EAHC MSs delegates and the representatives of international hydrographic offices. Around 54 delegates participated in the conference. They were mostly chief hydrographers from EAHC MSs composed of China, Indonesia, Japan, Malaysia, Philippines, Republic of Korea, Singapore, Thailand, and Vietnam. The Australian Hydrographic Service, the United Kingdom Hydrographic Office, and the Naval Meteorology and Oceanography Command of the United States of America sent their representatives as observers during the conference. International Hydrographic Organization (IHO) President Mr. Robert Ward was also present at the conference. NAMRIA Administrator Peter N. Tiangco welcomed the delegates from EAHC MSs and the representatives of other international hydrographic offices. 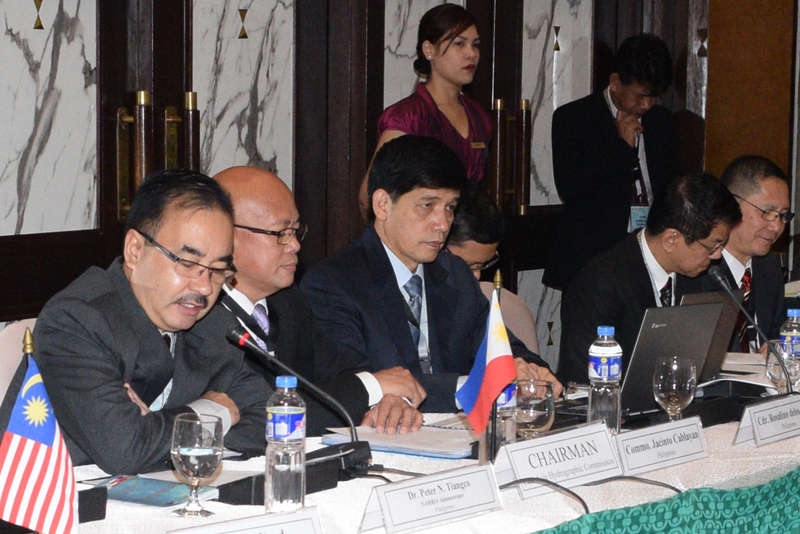 He said that the conference was a highly significant event of the commission in the light of the Aquino administration’s thrust to further enhance the country’s capabilities and expertise in hydrography, cartography, mapping and charting. He underscored the event as an excellent opportunity for the MSs to closely collaborate in order to adopt actions on various maritime problems and environmental issues for their mutual benefit. He encouraged MSs to share and exchange knowledge and expertise and explore possible areas for more collaboration and cooperation. In his address during the opening ceremony, EAHC Chair and Hydrography Branch (HB) Director Commodore Jacinto M. Cablayan acknowledged and thanked Administrator Tiangco for officially opening the conference. 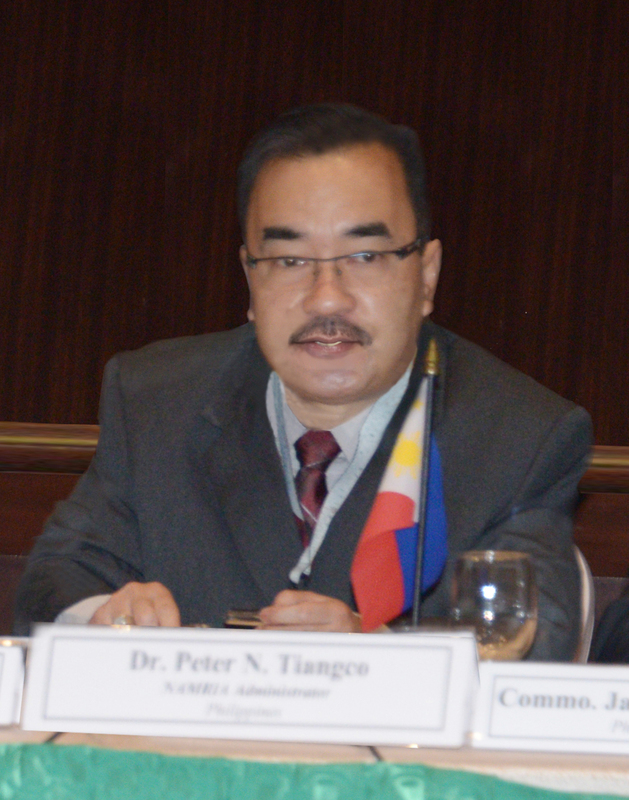 He said that he was honored to preside over the conference and expressed his gratitude and appreciation to all EAHC MSs present, the IHO, and other hydrographic offices for their cooperation and support which were extended to the Philippines during its term as the EAHC Chair. He also thanked the various EAHC committee chairs---Committee on Hydrography and Charting (CHC), Regional ENC Coordinating Center (RECC), TRDC BOD--and the EAHC permanent secretariat for providing the MSs their needed support and trainings on current technologies and development in the areas of marine cartography and hydrography. He said that the conference is a very momentous event as it marked the end of his tenure as the EAHC Chairman. He encouraged the MSs to continue supporting one another for the success of the commission which will strengthen solidarity and unity in the region and meet the common goal of ensuring safety of navigation and protection of the marine environment. He expressed his confidence in Malaysia, the incoming EAHC chair, and the upcoming elected vice-chair of the commission that they will take the lead to further advance MSs capabilities and sustain regional capacities. HB Director and EAHC Chair Commodore Cablayan delivers the opening address. Also in photo are some of the Philippine delegates from NAMRIA HB, namely: (2nd from left) Officer In Charge (OIC) Maritime Affairs Division Cdr. Rosalino C. Delos Reyes, OIC Assistant Director Herbert L. Catapang, and OIC Survey Support Division Cdr. Sheilon T. Cadaoas. TRDC-BOD Chair Mr. Jamie Chen of the Maritime and Port Authority of Singapore expressed his gratitude to the EAHC Chair for his support and for improving the capacity building of MSs during his term. CHC Chair Dr. Parry Oei of the Maritime and Port Authority of Singapore acknowledged the commission’s accomplishments under the leadership and guidance of the outgoing EAHC chair. The three-day conference featured reports of the following: IHO activities; EAHC Chair report on the commission’s accomplishments for the past three years; MSs national report for the past three years on the status of hydrography, charting, capacity building and future programs in their respective countries; and the admission of Vietnam and Brunei Darussalam as new IHO MSs to the Commission. Likewise, the conference included the following EAHC chair committee reports on their workgroup activities: TRDC, CHC, General Bathymetric Chart of the Oceans (GEBCO), and RECC. There were also presentation reports of Indonesia, IHB President, Republic of Korea (ROK), EAHC chair, Australian Hydrographic Office, and on other matters of common hydrographic interest. On the last day of the conference, the outgoing EAHC chair handed over the commission’s chairmanship to Rear Admiral Zaaim Bin Hasan of the National Hydrographic Centre of Malaysia. In his acceptance speech, Rear Admiral Bin Hasan thanked HB Director Commodore Cablayan for his exemplary service as EAHC chair for the last 12 months after taking over the chairmanship from retired NAMRIA HB Director Commodore Romeo I. Ho. He said that based on the MSs national reports, their current technical capabilities in hydrography and charting have grown to a level that they can be proud of and this is a testimony of the strong bonding and cooperation among the MSs. He encouraged the MSs to continuously work together as one cohesive team which will brace and underpin future dynamic challenges and eventually will drive the commission to greater heights. He said that he looked forward to working with the new vice-chair in ensuring stronger hydrographic cooperation among MSs of East Asia in the years to come. Finally, he commended the Philippines through NAMRIA for hosting the event and the hospitality shown to all the delegates. 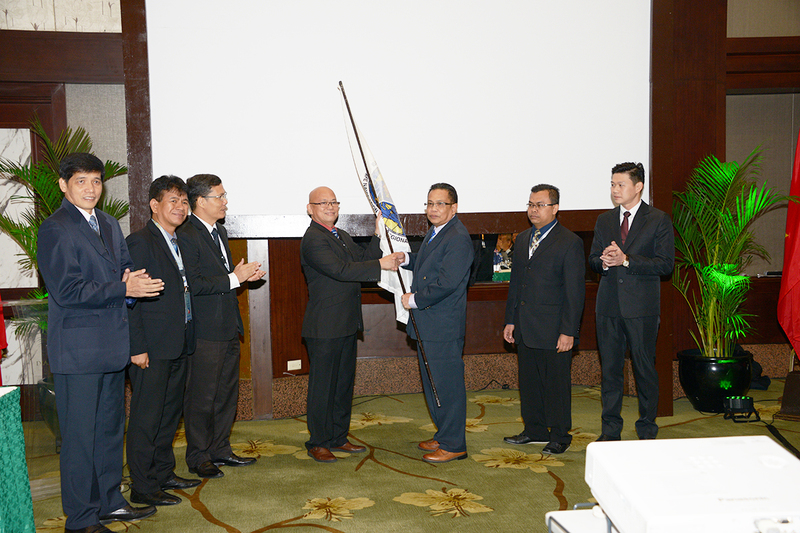 HB Director and outgoing EAHC Chair Commodore Cablayan hands over the EAHC flag to Rear Admiral Hasan of Malaysia during the ceremonial turn-over of the EAHC Chairmanship. The new EAHC Chair then proceeded to the election of the new EAHC vice-chair and asked the MSs for nominees. Japan, thru the Chief Hydrographer, Mr. Shigeru Kasuga,was nominated by Indonesia as the new EAHC vice-chair. Majority of the MSs supported this nomination and Mr. Kasuga later acknowledged being elected. The TRDC BOD chair opened their meeting on 12 October 2015 by thanking NAMRIA for hosting the meeting and welcoming all the participants. Mr. Chen thanked the BOD members for their participation and emphasized the importance of the TRDC in developing and implementing capacity-building programs in the East Asia region. He also thanked NAMRIA and the conference secretariat for the warm hospitality and excellent administrative and logistical arrangements provided for the meeting. Meanwhile, on behalf of the EAHC chair, HB Assistant Director Capt. Herbert L. Catapang emphasized in his welcome message the significant benefits of the capacity building of the TRDC, which he said has contributed to the region in terms of safety to navigation and protection of the marine environment. He then urged the participants to continue to build on this framework. TRDC BOD members and participants at the TRDC BOD meeting. Indonesia volunteered to host the next steering committee meeting which was planned to be held on 24-26 February. The next scheduled TRDC-BOD meeting is on 22-23 February 2016.